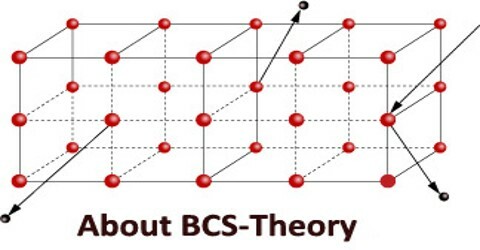 BCS theory, in physics, a comprehensive theory developed in 1957 by the American physicists John Bardeen, Leon N. Cooper, and John R. Schrieffer (their surname initials providing the designation BCS) to explain the behaviour of superconducting materials. Superconductors abruptly lose all resistance to the flow of an electric current when they are cooled to temperatures near absolute zero. John Bardeen, Leon Cooper, and John Robert Schrieffer shared the Nobel Prize in physics in 1972 for the theory’s development. John Bardeen also won a Nobel prize as one of the principle inventors of the transistor and hence shared in the winning of two Nobel prizes in physics. Pairs of electrons can behave very differently from single electrons which are fermions and must obey the Pauli exclusion principle. The pairs of electrons act more like bosons which can condense into the same energy level. The theory is also used in nuclear physics to describe the pairing interaction between nucleons in an atomic nucleus. BCS is able to give an approximation for the quantum-mechanical many-body state of the system of (attractively interacting) electrons inside the metal. This state is now known as the BCS state. In the normal state of a metal, electrons move independently, whereas in the BCS state, they are bound into Cooper pairs by the attractive interaction. The BCS formalism is based on the reduced potential for the electrons’ attraction. Within this potential, a variational ansatz for the wave function is proposed. This ansatz was later shown to be exact in the dense limit of pairs. Note that the continuous crossover between the dilute and dense regimes of attracting pairs of fermions is still an open problem, which now attracts a lot of attention within the field of ultracold gases. Cooper had discovered that electrons in a superconductor are grouped in pairs, now called Cooper pairs, and that the motions of all of the Cooper pairs within a single superconductor are correlated; they constitute a system that functions as a single entity. The transition of a metal from the normal to the superconducting state has the nature of a condensation of the electrons into a state which leaves a band gap above them. This kind of condensation is seen with superfluid helium, but helium is made up of bosons — multiple electrons can’t collect into a single state because of the Pauli exclusion principle. Froehlich was first to suggest that the electrons act as pairs coupled by lattice vibrations in the material. 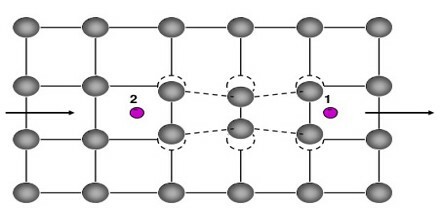 This coupling is viewed as an exchange of phonons, phonons being the quanta of lattice vibration energy. 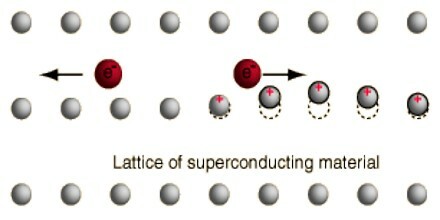 Experimental corroboration of an interaction with the lattice was provided by the isotope effect on the superconducting transition temperature. 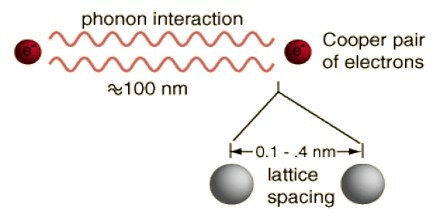 The boson-like behavior of such electron pairs was further investigated by Cooper and they are called “Cooper pairs”. 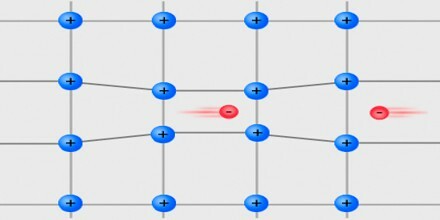 The condensation of Cooper pairs is the foundation of the BCS theory of superconductivity. BCS theory predicted a theoretical maximum to Tc of around 30-40K, as above this, thermal energy would cause electron-phonon interactions of an energy too high to allow formation of or sustain Cooper pairs. BCS derived several important theoretical predictions that are independent of the details of the interaction, since the quantitative predictions mentioned below hold for any sufficiently weak attraction between the electrons and this last condition is fulfilled for many low temperature superconductors – the so-called weak-coupling case. The electrons are bound into Cooper pairs, and these pairs are correlated due to the Pauli exclusion principle for the electrons, from which they are constructed. Therefore, in order to break a pair, one has to change energies of all other pairs. This means there is an energy gap for single-particle excitation, unlike in the normal metal, where the state of an electron can be changed by adding an arbitrarily small amount of energy. This energy gap is highest at low temperatures but vanishes at the transition temperature when superconductivity ceases to exist. The BCS theory gives an expression that shows how the gap grows with the strength of the attractive interaction and the (normal phase) single particle density of states at the Fermi level. Furthermore, it describes how the density of states is changed on entering the superconducting state, where there are no electronic states any more at the Fermi level. The energy gap is most directly observed in tunneling experiments and in reflection of microwaves from superconductors. BCS theory correctly predicts the Meissner effect, i.e. the expulsion of a magnetic field from the superconductor and the variation of the penetration depth the extent of the screening currents flowing below the metal’s surface with temperature. This had been demonstrated experimentally by Walther Meissner and Robert Ochsenfeld in their 1933 article Ein neuer Effekt bei Eintritt der Supraleitfähigkeit. It also describes the variation of the critical magnetic field, above which the superconductor can no longer expel the field but becomes normal conducting with temperature.